NORTH CAROLINA / Colonized, 1585-87, by first English settlers in America; permanently settled c. 1650; first to vote readiness for independence, Apr. 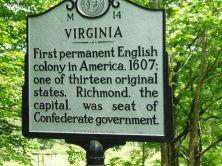 12, 1776 b/w VIRGINIA / First permanent English colony in America, 1607, one of thirteen original states. Richmond, the capital, was seat of Confederate government. Virginia and North Carolina boast the sites of the earliest English settlements in what would become the United States. The Roanoke colonies (1585-1587) are commemorated at Fort Raleigh in Dare County, North Carolina. The first permanent settlement of English colonists in the New World took hold in Jamestown, Virginia, in 1607, when three ships landed with 105 settlers. Famine and disease took a toll on the small settlement. Despite the trials of the first year, the colonists began to thrive with the influx of supplies and new arrivals from England. By 1619, settlers in Jamestown organized their government and the first colonial legislature held session. The colony prospered principally on the export of tobacco. Virginia and North Carolina’s early settlers were intermingled, particularly in North Carolina’s northeastern or Albemarle region, where colonists trickled down in search of good land to grow crops and establish homesteads beginning around 1650. Because many colonists easily traveled back and forth between the two, the border between North Carolina and Virginia was vague under it was first surveyed by Virginian William Byrd in 1728. Byrd and other surveyors defined the line from the coast as far westward as modern Stokes County, about 240 miles. 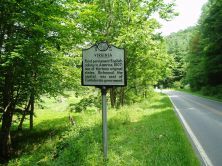 The survey of the boundary between the two colonies was completed in 1749 when Thomas Jefferson’s father, Peter, began in Stokes County and completed the survey to what is now Ashe County. The borders were often disputed and additional surveys have been called to settle claims, the most notable in 1887, when the two states sponsored another joint boundary survey. Virginians established their first capital at Williamsburg. Following the Revolutionary War and the surrender of Cornwallis at Yorktown, the capital was relocated inland to Richmond. That city later served as the capital of the Confederacy during the Civil War and suffered greatly as a result of fires that consumed much of the city as it fell to Union occupation. North Carolinians have always had a distinct reputation for being different from her neighbors to the north and south. That reputation was lent credence after publication of William Byrd’s journals. While surveying the boundary line, the aristocratic Byrd kept a journal of observations about North Carolina and her residents, considering them lazy and without religion. However, despite Byrd’s opinion, the two states share a common past related to colonial migration, the development of tobacco, old-time music, and familial ties. In fact, many residents of northeastern and piedmont North Carolina still work and shop in the cities of southern Virginia such as Norfolk, Newport News, Roanoke, and Danville. Reproduction of the Godspeed, one of three ships that brought settlers to Jamestown in 1607. Photo from the Washington Post.